With everything going on I forgot to share August’s finished objects. I can see why I forgot because I only finished one thing. 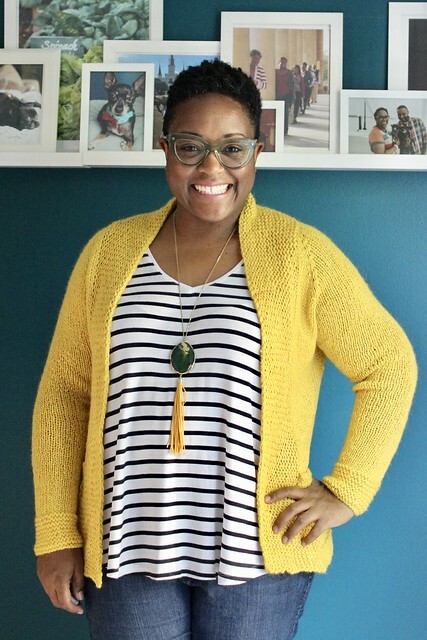 The sunny yellow Spindrift cardigan I made for my sister. I’ve been working on other things and just finished a test knit for myself that I’ll share soon but September will definitely have more. Was your August as slow as mine knitting wise? Love the Spindrift cardi. Sunny yellow, indeed! 🙂 My sole FO for August was a dishcloth, but I’ve got a lot of projects on the needles. It seems when I don’t have a deadline, I like to have at least 4 different projects going. I don’t know how you do it with 4 kids!